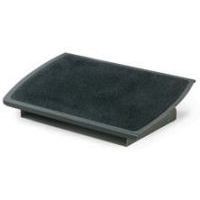 The Non-Locking Adjustable Metal Foot Rest from 3M has an extra-wide 22" wide non-skid platform. The Non-Locking Adjustable Metal Foot Rest has easy foot-controlled platform tilt adjustment, and both height and tilt are adjustable. The 3M Safety Walk slip-resistant surface keeps feet from sliding. The unit (both base and platform) is made of thin sheet steel. Depth (front to back): 13.75"